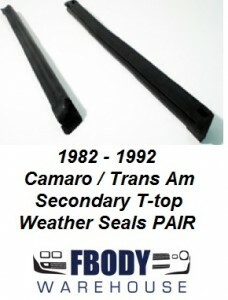 Correct outer side rail seals for 82-92 Camaro models. These mount to the 82-92 T-top glass panel. If the door glass was rolled all the way up, it would seal to these rubbers. Muscle Car Industries weatherstrips are made to O.E. specs for a perfect seal every time. Side rails have the correct hollow inner construction with dual inner walls to form the best seal on the market. Sold as a pair.